Hello! 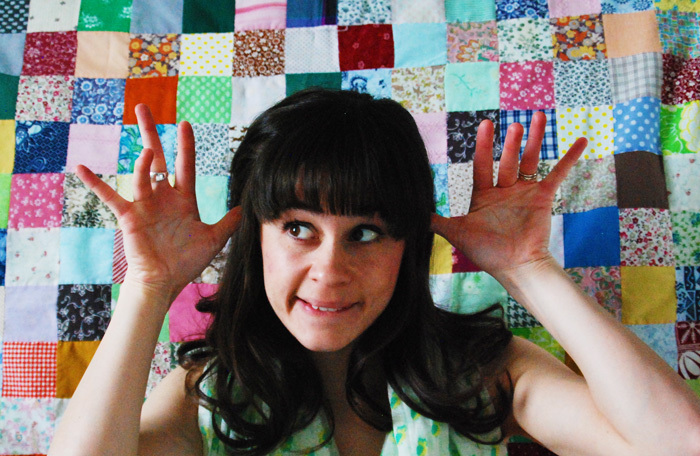 I’m RobbieLee, the creative behind Chickiedee Handmade, The Roblin Shop and A Beautiful Brand. I never liked the idea of only having to choose one thing to do in life, so I decided to pursue everything that I’m really passionate about (on and offline) – hence the three blogs. Ha! Anyhoo, I feel blessed to live and create in beautiful Colorado. I’m married to my college-sweetheart, Ron, and together we have two Blue Heeler pups (Frankie Li + Tucker Bean) and a fat cat that goes by the name, Brutus James. I believe that inspiration is key to living a productive and happy life. Here on Chickiedee, I share my inspirations, daily life and adventures, as well as DIY projects and my handmade shop. My weekly/monthly features include, Studio Sunday, Sunday Best, Life Lately, Explore + DIY. DIY – My mind (and idea book) is full of all kinds of DIY projects just waiting to be shared with you! Each Wednesday I’ll share a new fun and easy project to keep you inspired and happy. Studio Sunday – about once or twice a month, I feature a creative studio space on Sunday. The idea is to showcase your creative space to inspire others. We all have a space, big or small, where we create lovely things. The beauty is that each space looks, functions and feels very different from everyone else’s. We are always showing off our handmade goodies, but what about giving some credit to the lovely and creative space that we’ve also created! If you’re interested in having your studio featured and you fit in with the overall feel of Chickiedee, I’d love to have you! Contact me here and I’ll send you the info. Sunday Best – I love mixing and matching different colors, patterns, textures and eras! Each Sunday I share one of my outfits from the previous week. Life Lately – Over the past few years, I’ve been inspired to document my everyday life. The little things really matter to me and I love looking back through my photos and writings. It’s fun to see where I was compared to where I am now. Growth, change, adventure, love – it’s all about the memories for this gal! Explore – I’ve always looked forward to our family vacations while growing up. There’s something so wonderful about stepping into a new place and exploring it. Whether it’s the next city over or another country, I want to see all that it has to offer. A bonus to traveling is sharing my stories and experiences! •• Before it was Chickiedee | Handmade, it was Chickiedee | Modern Apparel for Babies. I really wanted to expand and show what else I can do. I still make all of my baby items and I’ve grown to make more! •• It’s Chickiedee, not Chickadee… Many people kindly tell me that I spelled it wrong, but it’s not chickadee, like the bird. It’s Chickiedee, my nickname. (Smile) Thanks for looking out though! •• The name Chickiedee is the nickname my mother gave me when I was about 3 years old. I used to have a soft and fluffy yellow coat with a chickie on it and it was my absolute favorite. I wore it everywhere. So, she eventually just started calling me Chickiedee and it stuck. 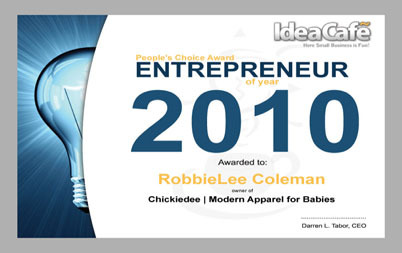 RobbieLee at Chickiedee… it has a nice ring to it, dontcha think?! •• Me in a nutshell: I’m an all-around Creative, I’m a graphic designer, crafter, quilter, painter, artist, animator, animal lover, chocolate-addicted beast, wife, daughter, sister, lover of all things vintage, open-minded, blogger, cardigan obsessed, thrifter, pigeon lover, traveler, amateur photographer, entrepreneur, illustrator, Crock-Pot guru, jokester, party hostess, Sharpie lover, pea coat collector, magazine reader, sketchbook keeper, fabric collector, Instagramer, party planner, color obsesser, family gal, swing dancer, recycler, Mac obsessed, designer, friend, video editor, collector, shopper, handmade supporter, Native American, Danish, Irish, Spanish, DU Alum, Colorado Native, inspiration, snowboarder, wakeboarder, sandboarder, new roller derby gal, orchid fan, gift wrapper, bumblebee protector, Halloween participator, Mark Rydan-Tim Burton-Ray Caesar admirer… who sees the world through rose-colored glasses… phew! The name Chickiedee is the nickname my mother gave me when I was about 3 years old. I used to have a soft and fluffy yellow coat with a chickie on it and it was my absolute favorite. I wore it everywhere. So, she eventually just started calling me Chickiedee and it stuck. She still calls me by this name to this very day. Here at Chickiedee we believe that it’s important to be as gentle on the environment as we possibly can to ensure that our children can have a healthy place to grow and play. That’s why we try our best to use eco-friendly materials and practices to create all of our products. All of Chickidee’s one-pieces are 100% Cotton or 100% Organic Cotton for the most comfort and sustainability. All of our items are American made, sweatshop-free and handmade with care. We encourage everyone to recycle and reuse as many items as possible. If we all work together, we truly can make a difference and our children will surly benefit from it. What’s in my Nixon Bag? As Seen on HGTV Canada! Categories Select Category 4th of July | Summer Art + Graphic Design Beauty + Style Brutus + Frankie + Tucker Chickiedee | Handmade Christmas | Winter Daily Life DIY Easter | Spring Halloween | Autumn Humpday Tutorial Life Lately Monthly Favorites Old + Unrelated Photography Press + Mentions Recipes Roblins Self-Portraits Studio Sunday Sunday Best Thanksgiving Travel Valentine’s Day What’s In My Bag?